PRESS RELEASE: HP recently announced the industry’s most self-sufficient line of servers – the HP ProLiant Generation 8 (Gen8). HP ProLiant Gen8 servers are the result of a $300 million, two-year program called Project Voyager, the company’s initiative to redefine data center economics by automating every aspect of the server life cycle. To date, Project Voyager has resulted in more than 900 patents filed and a new systems architecture called HP ProActive Insight architecture, which will span the entire HP Converged Infrastructure. Companies spend an average of $24 million over three years on manual operations to support servers. HP ProLiant Gen8 triples administrator productivity by eliminating most manual operations such as server updates, which typically take five hours of administrator time per rack of servers. The industry-first HP Smart Update feature can perform the same update in 10 minutes or less. Growing server energy and facilities expenses cost companies up to $29 million over three years. HP ProLiant Gen8 features HP 3-D Sea of Sensors, an industry-first technology that identifies over-utilized servers based on real-time location, power, workload and temperature data, increasing compute capacity per watt of energy by 70 percent. HP 3-D Sea of Sensors also automates energy efficiency while eliminating 100 percent of manual configuration and inventory process errors. Unplanned downtime costs clients approximately $10 million an hour. With industry-first HP Active Health and HP Insight Online technologies, HP ProLiant Gen8 is the only server that automatically analyzes its own health across 1,600 data points. Through self monitoring, self diagnosing and proactive support, clients can resolve unplanned downtime issues up to 66 percent faster. HP ProLiant Gen8’s ProActive Insight architecture comprises powerful hardware and software that delivers server life cycle automation. At the same time, it provides continuous intelligence on server health, power usage and other important diagnostics. As a result, online system updates can be deployed three times faster, with as much as 93 percent less downtime. Integrated Lifecycle Automation – speeds application deployment and proactively improves up-time by automating manual tasks. As a result, clients can increase productivity, reduce errors and greatly simplify operations. With these improvements, HP ProLiant Gen8 servers enable IT staff to save more than 30 days of administration time a year per person in a typical 10,000 square-foot data center. 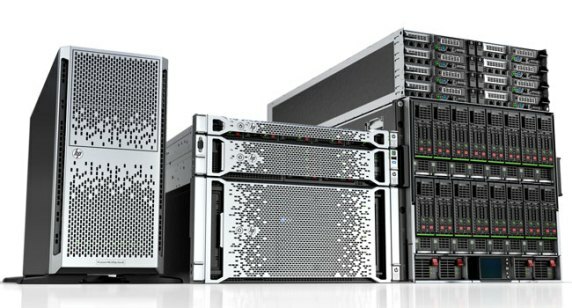 Dynamic Workload Acceleration – improves data-intensive storage performance by almost seven times with a converged server and storage design that leverages intelligent, HP solid-state technologies. Smart analytics and workload-aware intelligence enable HP ProLiant Gen8 servers to adapt in real time to optimize system performance and efficiency. Unique HP Advanced Data Mirroring and smart algorithms ensure data is as much as 1,000 times safer, speeding Redundant Array of Independent Disks (RAID) initialization by 95 percent. Automated Energy Optimization – delivers nearly double compute-per-watt capacity and saves $7 million in energy costs in a typical data center over three years with HP ProLiant Gen8 energy-efficient servers and industry-first intelligent racks that feature built-in sensors. HP 3-D Sea of Sensors automates inventory management and precisely tracks power usage per rack and server, allowing administrators to easily optimize workload placement. 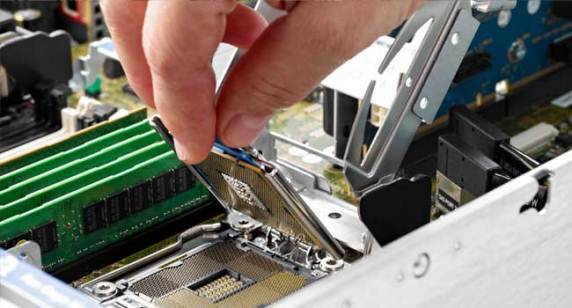 Competitive servers force organizations to manually inventory, track and measure power and cooling. This requires extensive resources, incurs risk of downtime due to configuration errors and drives up energy costs. Proactive Service and Support – enables clients to achieve a 95 percent first time issue resolution rate with HP Insight Online, the industry’s most comprehensive cloud-based, IT management and personalized support portal. HP Insight Online is integrated with HP ProLiant Gen8 intelligent technologies, HP Insight Remote Support and HP services, and offers clients a converged server management and support experience through the automatic collection of server assets, health, contract, warranty and support case information. Data is available securely anywhere, anytime, allowing clients to grant access to HP-authorized channel partners via the HP ServiceONE program, providing proactive problem prevention in addition to rapid resolution.